Jiufen (九份, also Chiufen or kyuufun / きゅうふん in Japanese) is Taiwan's most famous tourist attraction outside of greater Taipei but within easy reach for a day or overnight trip. It's most famed for its beautiful views mountain and pacific views, its teahouses, its hikes and perhaps most important its history and movie fame. Jiufen is a compulsory stop on the Japanese tourist circuit. Jiufen is busier and accommodation more expensive during the weekend, but being mostly polite Japanese, the crowds are bearable, and prices don't rise as much as other popular tourist excursions. So it's best to spend weekends in Taipei (and book hotels in advance) but if you must spend a weekend elsewhere then it's much better here than in Hualien, Taroko Gorge or Jiaoxi. Most of the old street is undercover, but avoid visiting during bad weather. Jiufen can be a few degrees colder than Taipei. Bring as little as possible as you'll probably go to Jinguashi or Houtong the next day and not return to your accommodation in Jiufen, so there's nowhere to leave luggage. If you can't leave it at your accommodation in Taipei leave it at Taipei Main Station. Jiufen was one of only a small part of Taiwan developed during its era under the Qing Dynasty (1683-1895). There were, at one point, nine families living there, so they would request "nine portions" of supplies from the government, which became the town's name and is still in use today. In 1893 gold was discovered, and the subsequent gold rush brought rapid development. In 1896 the Japanese took control of Taiwan under the Treaty of Shimonoseki, and rapidly developed the area into a prosperous gold mining town. At its peak the mines in the area were a significant contributor of raw materials (especially coal and gold) to the Japanese empire, and its from this era that most of Jiufen's and the surrounding area's fame comes. Much of the famed tourist areas of Jiufen were originally an entertainment district (euphemistically speaking) for the miners, and many old buildings survive from this period, giving the area a feeling similar to parts of Kyoto and other Japanese localities which have kept or rebuilt their traditional style. During World War II the Japanese built a POW camp in Jiufen (Kinkaseki / 戰俘營), and many allied soldiers captured in Singapore were forced to work in the nearby mines, needless to say in appalling conditions. After Japan's surrender, and the subsequent handover of Taiwan to the Republic of China, Chinese soldiers flooded Taiwan and looted the country for anything of value to send to China to support their war effort against the communists, much of the mining equipment was melting down and sent back to China. Cheaper coal flooded in from China, productivity fell, and mining operations were ceased in 1971, leaving the town all but forgotten. It sprang to fame and reinvented itself as a tourist destination in the 1990s, after its contribution to several movies, most famously the Taiwanese film "A City of Sadness" and (perhaps) Japanese "Spirited Away". In 1989, as Taiwan was just entering its modern era of democracy, movie producer Hou Hsiao-Hsien used Jiufen as the setting for his famous movie "A city of sadness", the first movie to depict the 2-28 massacre and openly discuss the White Terror era of Taiwan (in which thousands of Taiwanese ere killed by the Kuomintang / Chinese Nationalist Party government under Chiang Kai Shek - see 2-28 Peace Memorial Museum). It was the first Taiwanese film to win the Golden Lion Award at the Venice Film Festival. This triggered a revival of the area, as Taiwanese began to flock to Jiufen for a taste of old Taiwan. Amei's Teahouse, a former blacksmith's workshop now run by his granddaughter, is considered similar in appearance to Yubaba, the bathhouse from Spirited Away, but that may be as far as the connection to the movie goes. But it doesn't stop countless Japanese tourists visiting. It's widely believed that in 2001 Japanese film producer Hayao Miyazaki was inspired by Jiufen in his production of the movie Spirited Away (千と千尋の神隠し), about a ten year old girl who is whisked away to the spirit world, and her trials and tribulations in trying to return to the physical world. As an animae (cartoon) film there was of course no actual filming involved, but Jiufen (along with other places in Japan) is said to have contributed much of the inspiration behind the depiction of the spirit world, with many scenes from the film apparently very similar to Jiufen. Some enthusiasts have tried (somewhat successfully) to match their photos of Jiufen with screenshots of the film. However, there's little evidence to back this up claim, or even whether or not Mr Miyazaki ever visited Jiufen. It may simply be a legend stemming from the apparently similar appearance between Amei's Teahouse and Yubaba (the bathhouse). Whatever Jiufen's connection, if any, to Japan's most successful film ever (which attracted more viewers than the Titanic) Japanese tourists flock to Jiufen to photograph Amei's tea house, and seem to almost feel as if they themselves have been spirited away into the world of the movie in being there. Every Japanese tourist and student I've met in Japan has either been there or been planning to; around the old street one hears more Japanese than Chinese. Shiqu Road (aka Jiufen Old Street), the most famous attraction, is really just two narrow, mostly covered lanes, filled with restaurants, teashops and souvenir shops selling vast quantities of "Taiwanese" products, many of which you'll never see anywhere else. The most significant street is the Shuqi Street, a long , narrow and usually very crowded stairway. It's clearly made to resemble the old-school Japan look that it once would have had (complete with fake cherry blossoms!) and while a few newer, less attractive buildings spoil the image somewhat, at times it really does feel like a somewhat older Kyoto, and really is very beautiful.The shops close up early, with most businesses closed by nine o'clock, so I recommend going to bed early and getting up to enjoy the beautiful views, and/or hike in the mountains, early the next day. Shuqi Road is Jiufen's most photographed street, and possibly even in all of Taiwan. It's customary to drink tea in Jiufen. The first teahouse to reestablish itself in the 1990s was the Jiufen Teahouse, which is housed in a beautifully-restored, century old Japanese building, which was originally the operation headquarters of a gold mining company, then became a Chinese medicine clinic and finally the tea house in 1991. Stepping in here feels like stepping into another time. Ceramics are sold downstairs. It's disappointing that they keep so many fish in a tiny indoor pond. Only tea and snacks are served. It costs NT100 plus a tea purchase (35 grams, starting at NT400) to drink as much tea as you like (and you take the rest of the tea away with you). Alternatively you can pay NT200 and bring your own tea. The Jiufen Teahouse (九份茶坊) is at 142 Jishan Street (turn right as you reach Jishan Street from Shuqi Street (the main stairs). Here are directions from your location. There are countless other tea houses at Jiufen offering a similar service. Amei's Teahouse (from Spirited Away - see below) is also very popular, especially with Japanese, but gets mixed reviews for its food and service. While Jiufen has its own mining history, I recommend spending most time in Jiufen either exploring the old street, drinking tea or hiking in the mountains (especially Siaocukeng Ancient Footpath). Save a mining history tour for Jinguashi (gold and copper) and Houtong (coal). This coal mine (五番坑道) was excavated in 1927 and finally sealed up in 1971. It's worth stopping by on your way to Songde Park (for the Siaocokeng Ancient Footpath) but if you're interested in mines it's best to go inside the old Benshan Fifth mine tunnel in nearby Jinguashi. This small memorial park is about a ten minute walk from Jiufen. It's a pleasant spot to rest and enjoy views of Jiufen and the surrounding mountains and sea. The park is centred around a memorial statue of Yen Yun-nian, who founded Jiufen's mining culture early last century. His former operations office (Taiyang Company Ruifang mining Operation Office / 台陽礦業事務所) is located just below Jiufen Station. I highly recommend the SiaoCuKeng Ancient Footpath Trail which starts from this Park. The Jiufen Kite Museum (Chinese website) features an incredible array of real kites. Mt Jilong (aka Big Belly Beauty Mountain) as seen from the Siaocukeng Ancient Footpath Trail, with Jiufen below. Perhaps the most famous hike is up Mt Jilong / Keelung (基隆山), the mountain visible from most of Jiufen. It's said to look like a pregnant woman lying on her back, and is known colloquially as Big Belly Beauty Mountain. It takes about forty minutes to the peak. Be sure to take warm clothes and enough food and drink. This hiking path (小粗坑古道) is my favourite hike in Taiwan. It starts at Songde Park and continues up the mountain behind Jiufen and over to Houtong, a former coal-mining town just coming to tourist fame, largely for its domestic cats. The path passes through the eerie ruins of the former SiaoCuKeng Settlement, a small but wealthy coal gold mining community which is now all in ruins, mostly overtaken by jungle, offering some incredible photo opportunities. Much of the path follows the workers' daily trek up the stone steps to the mines in Jinguashi, and stops at a couple of somewhat maintained old temples. See my full page for more photos and safety information. 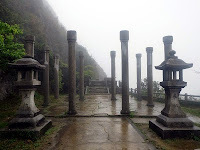 While most people visit Jiufen as a day trip from Taipei, it's well worth staying the night, and either getting up early the next day to walk to Houtong, or spending the next day in Jinguashi, or another of the area's many great hikes. There are no large hotels in Jiufen, but there are several small hostels in Jishan Street, a few minutes walk south of Jiufen Old Street, just past the Jiufen Teahouse. Rooms generally start at around NT2000 per night in Jiufen, or slightly less further away. 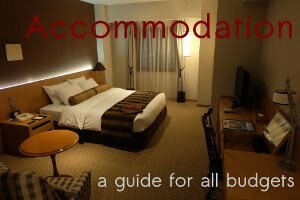 I recommend booking one online whenever you go, but it's absolutely essential if you'll be there for a weekend. (Prices are higher during the weekend, but not by nearly as much as Taroko Gorge). I stayed at the Jiufen Walk Hotel (really a hostel), which is one of the best value in Jiufen. Rooms are tiny and minimalist (mattress on the floor), and the bathroom the smallest you'll ever see, but it's clean and perfectly functional for a night in Jiufen. The rooms are a few minutes walk from the reception, so it's best not to have too much luggage, but I recommend not bringing much to Jiufen anyway, especially if you'll be hiking, but wherever you go the next day it will be inconvenient to return to Jiufen to collect luggage. If you don't have a smartphone / tablet tell the driver where you want to get off, as the bus stops on the main road, from which it's a short walk up to Jiufen, so it would be easy to miss. If lots of people get off the bus (except school students), chances are you're there. All the trains and buses in these trips should accept the Easycard. 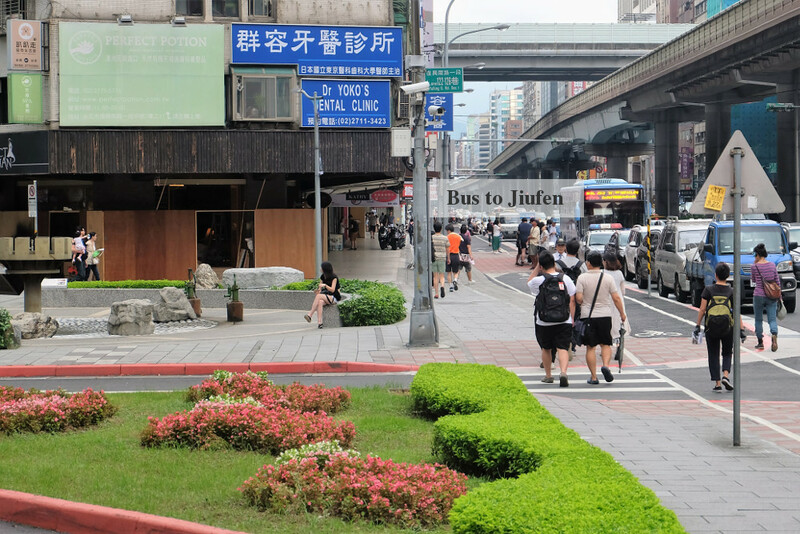 The easiest and most popular route to Jiufen is to take bus 1062 from Zhongxiao Fuxing Station. Take Exit 1, do a U-turn as you leave the exit (on Zhongxiao East Road, Section 3), and when you get to the intersection turn left (north) into Fuxing South Road (Section 1). The bus stop has moved a block north from its former stop outside the Kao Chi stop. Walk north until you cross an intersection with a road island and garden (connected with a small park) in the middle. Bus 1062 leaves from the bus stop right across the intersection with the road island. It's signposted in English, and if there are touts even more desperate than before to lure you off the adequate bus into their overpriced taxis (see below) then you know you're in the right place. A faster and more pleasant route is to take the green MRT line (or the conventional train) to Songshan Station, the terminal station, or the regular Taiwan Railways Administration train (the conventional train, not the High Speed Rail) to Songshan Train Station. Take the main Songshan Station exit and the bus bay is across the road, or take MRT Songshan Station Exit 4, turn right as you exit, carefully cross the pedestrian crossing and the bus leaves from the bus bay across the bus depot. However, at busy times (such as weekends) the buses often fill up leaving Zhongxiao Fuxing, leaving passengers taking this "shortcut" waiting for a seat outside Songshan Station. If you find yourself in this situation, instead of taking the MRT back to Zhongxiao Fuxing Station take the conventional train from Songshan Station to Keelung Station (see below) as these buses don't come from Taipei so are more likely to have seats available. Please do not use this approach during busy times (weekends and evenings) as buses often fill up at Zhongxiao Fuxing, leaving would-be passengers waiting a long time for a seat. If you find yourself in this position just go back into Songshan Station and take the train to Riufang Station (see below). Alternatively, take the train to Riufang Station. Any northbound train NOT bound for Keelung except the Taroko Express should stop there, and it's covered by the Easycard (so it's possible to jump on any train, without a seat reservation) but if in doubt buy a ticket on a specific train (and you may also get a seat). From there take bus 788 (slower, less frequent) or 1062 (faster, less frequent) to Jiufen. To reach the bus stop, walk out Riufang Station and turn left, and then follow the signs (or Google Maps). As always, ignore the taxi touts. Keelung used to be a typical ugly port city, but much effort has gone in in recent years to clean it up, and it's now quite pleasant to explore (post coming soon). The reach Jiufen from Keelung take bus 788 from Keelung Station. It takes a little over an hour (in good traffic) and costs 30NT. It can get quite cold in Jiufen, with a northerly wind bringing in cold air from above. Also bring sturdy hiking shoes and enough snack food if you intend to hike. The hiking trails can be quite steep, so if you intend to hike and stay overnight if possible leave your luggage at Taipei Main Station. There are also lockers in Keelung Station. 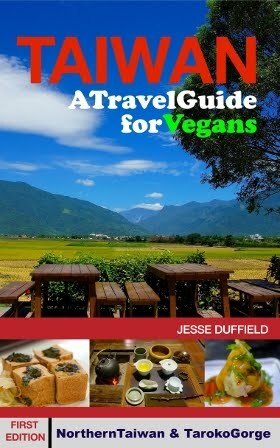 Vegetarians and vegans or anyone else with dietary requirements should bring food from Taipei. Unfortunately a team of very aggressive, belligerent touts have began targeting tourists (especially Japanese) around Zhongxiao Fuxing Station. This type of illegal soliciting (commonplace in countries like Thailand and India) is rare in Taiwan, so hopefully this isn't a sign of things to come. The touts gather up unsuspecting tourists, lead them to the wrong bus stop, then try to convince them that the bus takes two hours because it takes the local roads, and offer a "discounted" taxi fare to Jiufen which apparently takes the highway. In reality much of the route to Jiufen follows a small country road (Jiufen being an isolated, coastal town) but a taxi will be little if any faster in the traffic jams than a bus, and the bus takes the highway as much as possible (towards Riufang). I strongly recommend completely ignoring these touts. I see no reason to take a taxi as the buses are regular and comfortable, but if you want to it would be much safer and almost certainly cheaper to flag one down than to negotiate with these con men. The view from Jiufen at night, looking towards Keelung (Jilong).